So you reckon the ol' Windsor powered Aussie Ford Falcon has next to no potential compared to a LS1 Holden Commodore, eh? Well you can take that thought and flush it down the porcelain; the all new Herrod-developed Vission upgrade is capable of transforming an AU-series bent-eight into a highly desirable street fighter that can punch the wind out of a Gen 3 Holden. 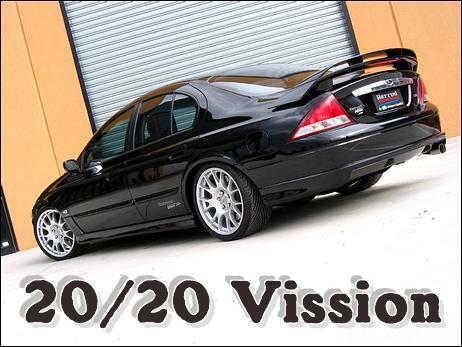 What you're seeing here is Rob Herrod's own special plaything - a full house Vission 300 built up from a 2001 AUII Fairmont Ghia base. Rob tells us his company's Vission kit can be ordered from selected Ford dealerships throughout Australia and New Zealand and it can be tailor made to suit the customer's preferences - you can get just the brakes, just the suspension or whatever. Rob's promo vehicle, however, is one with the lot - it's got the ripsnorter driveline, suspension, brakes, interior and, of course, looks. Under the bonnet of this beast is the long-serving Windsor V8, which Herrod has taken out to 5.7-litres using an in-house developed steel crank. Rob tells us the block requires "notching" to suit the long-throw crank, and this one's also been fully prep'd (ie stress relieved, machined and balanced). The oil and water pump have also been "hand massaged". Teamed with the crank are H-beam rods throwing around a set of quality Ross pistons (configured to deliver around 10.0:1 compression). Atop the block sits a pair of Trickflow 'Twisted Wedge' aluminium heads complete with Trickflow valves. These valves are opened and closed by a Herrod/Crow camshaft linked to Crow chrome-moly pushrods and 1.6:1 Competition Cams roller rockers. 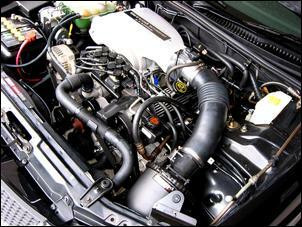 Airflow into the engine tears through a Cobra Mustang airbox, 90mm airflow meter and a fat 80mm Herrod throttle body. 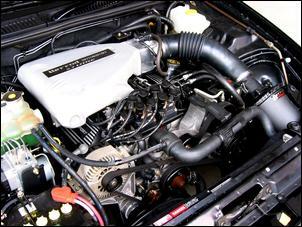 The intake manifold itself is Trickflow TFS unit, which is modified by Herrod. Spent gasses exit the engine through a custom pair of 4-into-1 headers with 1¾-inch primaries, leading into a twin 2½-inch mandrel stainless steel system with an X-pipe, high-flow cat converters and mufflers. Interestingly, the standard AUII engine management system has been remapped to suit the significant engine changes; it now fires eight 30lb injectors working with a high-flow fuel pump. Ignition hardware remains completely standard. The full-spec Vission 300 mill has enough spice to bring tears to the eyes of HSV GTS/SV300 owners - the 300 part of the Vission name denotes there's 300 flywheel kilowatts on tap but, realistically, we're talking closer to 320kW. These figures are entirely believable when you learn that a healthy 230kW has been seen at the back wheels using a Dyno Dynamics chassis dyno. Rob isn't quoting any performance figures but - heck - if you take the 300kW HSV as a yardstick, you could bet the farm that this thing should be good for low 13s/high 12s over the quarter mile, depending on traction. That's seriously fast for a car that's entirely streetable. To bring the Vission inline with the Holden/HSV offering, the big mumma Windsor is backed by a T-56 6-speed manual gearbox - as seen in the Cobra Mustang. Herrod sell this 'box as part of a complete kit comprising custom mounts and tailshaft. Between the IRS rear-end resides a 3.45:1 LSD diff (the same ratio as found in Tickford XR8s). 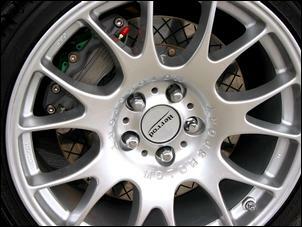 The brake upgrade is nothing short of dynamite. It's fair to say that 390mm cross-hatched discs and Harrop 4-pot calipers at the front and 375mm Harrop 4-spot'd rears are capable of slowing this 1700-odd kilogram monster with eyeball popping power. Just as well. And just when you thought it wasn't possible to sink your fingers any deeper into the dash, you realise how swiftly this big Ford can get its tail around corners. Rob's well and truly seen to the handling side of things with a set of custom coil-overs at each corner. These feature a mono-shock design and adjustable ride height (this car sits around 70mm lower than the standard car), though the dampers are not externally adjustable. Visually the Herrod car screams power and, at the same time, class. 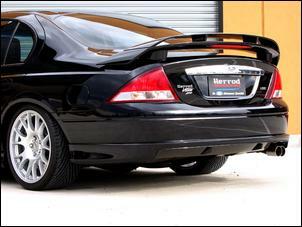 The only add-on to the factory Ford body kit is a Herrod stick-on biplane wing atop the standard spoiler. Neat, eh? After all the work with the tools, it was also decided that a full paint freshen up was required; the finish is superb. 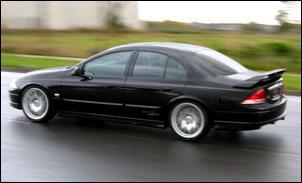 And who could ignore those massive 19-inch rims? 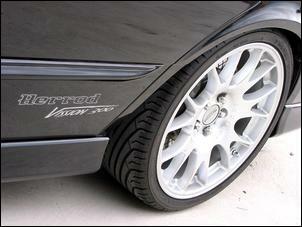 These are Herrod's own BBS-based configuration, measuring 19 x 8.5 at the front and 19 x 9.5 at the rear. Yokohama V102s - 265/35 19 at the front and a stonking 275/30 at the back - ensure things stay on-track under extreme driving conditions. And now we step onboard. 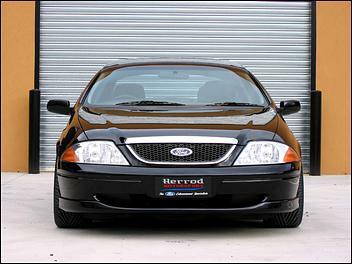 As if the Fairmont Ghia isn't already plush enough, Rob's car has had a pair of Recaro pews bolted into the front and some trick U-shaped headrests have been added to the rear bench. The whole lot has been beautifully retrimmed in leather. Contrasting with this is a carbon fibre strip along the passenger's side of the dash and along the doors; these were sent to Germany for the job! The sound and sight system is - astonishingly - all factory fare. Take the Ford 'Rex' audio-visual system and you've got DVD, VCD, CD and a quality speaker system. 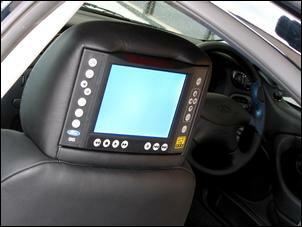 Oh, and check out those LCD screens in the back of the front seat headrests! Okay, by now I think we've well and truly established that there is something out there for Aussie Ford V8 fans to sink their teeth into - it's the piece-it-together-as-you-wish Vission. A bonus attraction is that the whole package allows you to keep the factory Ford warranty, while the mechanical mods - where specified - are covered by Herrod themselves. Could it be any easier? All you need to do is walk into a Ford dealer - or Herrod's Thomastown Melbourne workshop - and ask for a car that'll make a HSV GTS owner cry!